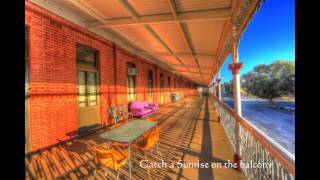 The Palace Hotel is located in the heart of the Heritage City of Broken Hill. An iconic hotel famous from its starring role in the hit movie 'Priscilla Queen of the Desert'. Its architectural beauty is enriched with over 500 square metres of colourful murals by indigenous artist Gordon Waye. Upper floors offer a large range of accommodation from en suite rooms, pub style, family rooms, dorms and the famous "Priscilla Suite". Take in any part of the day on the spectacular veranda with views over Broken Hills Main Street. Downstairs boosts a gorgeous bar, dining and conference rooms. Bar and restaurant open seven days a week with a great selection of craft beers, refined cocktails, wines and eating options. It's home to Australia's only all year Two Up Game - you can have a spin Fridays from 9pm - plus hosts the fabulous BrokenHeel Festival for three days in September - Priscillas Birthday Party!